actuator, limit switch, and indicator. Valves are used to control the flow of fluids in process systems. In order to meet the needs of a process system some method of changing the positions of the valve is needed. Some valves can be operated with hand wheels or levers, but some valves have to be open and closed or throttled frequently. Manually positioning valves in these types of situations is not always practical. So instead of hand wheels or levers, actuators are used to position the valves. An actuator is a mechanism that moves or controls a device such as a valve. Actuators reduce the need for operators to go to every valve that needs repositioning and operate the valve by hand. 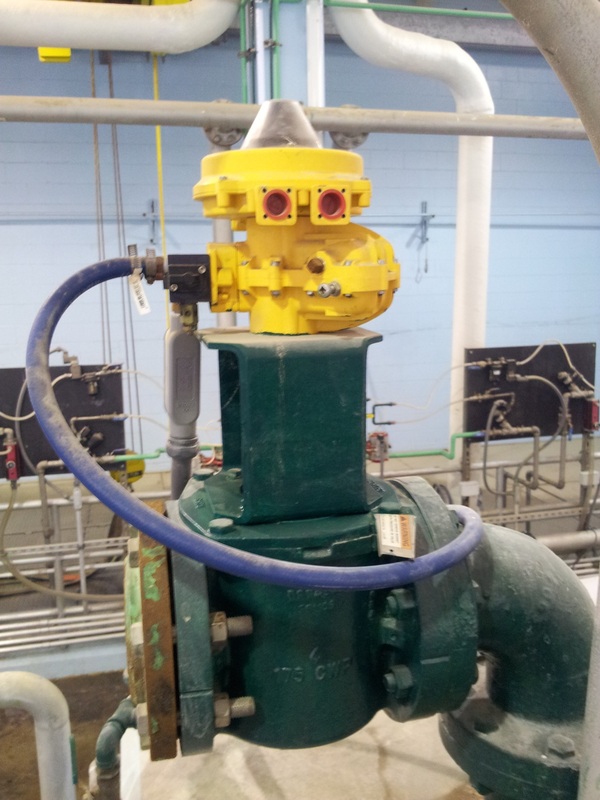 When actuators are used, valves can be repositioned from a central remote location, such as a control room. This is very important in processes where a number of valves have to be repositioned accurately and quickly. There are three basic types of actuators pneumatic actuators, hydraulic actuators, and electric actuators. Pneumatic actuators use air pressure to produce motion to position the valve. They're probably the most common type of actuator used in process systems. Actuators that are powered by a pressurized liquid, such as hydraulic fluid, are called hydraulic actuators. Compared to pneumatic actuators, hydraulic actuators of the same size are usually more powerful. Electric actuators use electricity to produce motion. They usually fall into one of two general classifications: solenoid actuators or motor-driven actuators. Regardless of the type of actuator used with valves, actuators are normally part of process control systems. From a control room, valves with actuators can be quickly and accurately positioned to deal with frequent flow changes. Valve actuators operate to position valves in response to signals from controllers. Controllers are part of the instrumentation systems that monitor plant processes and response to variations in the processes. Basically a controller is a device that receives an input from another part of the instrumentation system, compares that input to a set point, and sends out a corrective signal to regulate the value of a process variable such as temperature, pressure, level, or flow. Generally, actuators are used with valves that are designed for throttling or regulating flow. Valves that are used to automatically throttle flow are generally referred to as control valves. However some on-off or isolation valves may also require actuators. Although these isolation valves may require actuators, they're not commonly referred to as control valves. Control valves can be either linear that is the stem moves the valve disc up and down as in globe and gate valves, or they can be rotary which means that they're positioned by rotation. Butterfly valves and ball valves, which open or closed with a 90-degree turn, are examples of rotary control valves.